BOSTON, Mass. 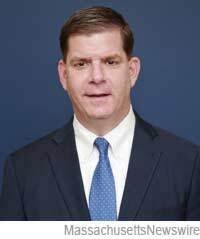 /Massachusetts Newswire/ — On Thursday, in honor of Women’s History Month, Boston Mayor Martin J. Walsh joined the Office of Arts & Culture and the Office of Women’s Advancement in launching Lift/Women PowerLifters. This art display will feature the exhibition by photographer Liane Brandon in The Mayor’s Gallery on the fifth floor at Boston City Hall. The exhibition will be on display March 1 – March 31, 2015. LIFT is a series of photographs celebrating four women powerlifters – women who defy physical and cultural stereotypes. They range in age from 27 to 60 and have all won regional, national or world competitions. Lodrina, a forensic computer expert, weighs 123 pounds and can lift 385 pounds. She recently placed first in national competition. Jessica has a bachelor’s degree in kinesthesiology. Candace is a mother, the lead singer in a band, and a national titleholder. Jane, the oldest, is a grandmother who went to Wellesley College. She holds four world records. Brandon has created astounding images that convey the physical nature of the sport while evoking the spirit of these women. Liane Brandon (http://www.lianebrandon.com) is an award-winning independent filmmaker, photographer and University of Massachusetts/Amherst Professor Emerita. She was one of the first independent women filmmakers to emerge from the Women’s Movement. She is a co-founder of New Day Films, the nationally known filmmaker distribution cooperative. Brandon has photographed wildlife, jazz musicians, artists, writers, Cape Verdean longshoremen, and production stills for the PBS television series American Experience, Nova, and American Masters. Her photos have been published in the New York Times, the Los Angeles Times, the Boston Globe and many other publications. Her groundbreaking films Anything You Want To Be and Betty Tells Her Story were among the first and most popular consciousness raising tools of the Women’s Movement. Her films have been featured on HBO, USA Cable, and TLC and presented at MoMA, the Boston Museum of Fine Arts, the Whitney Museum of American Art and the Tribeca Film Festival. The Galleries at Boston City Hall are open to the public at no charge. Boston City Hall is accessible by MBTA via State Street (Orange and Blue lines) and Park Street (Green and Red lines). For additional information, call 617-635-3245, or visit http://www.cityofboston.gov/arts.